Showing your impact and sharing inspiring stories is the best way to engage with your individual and business donors, helping you to raise more funds. 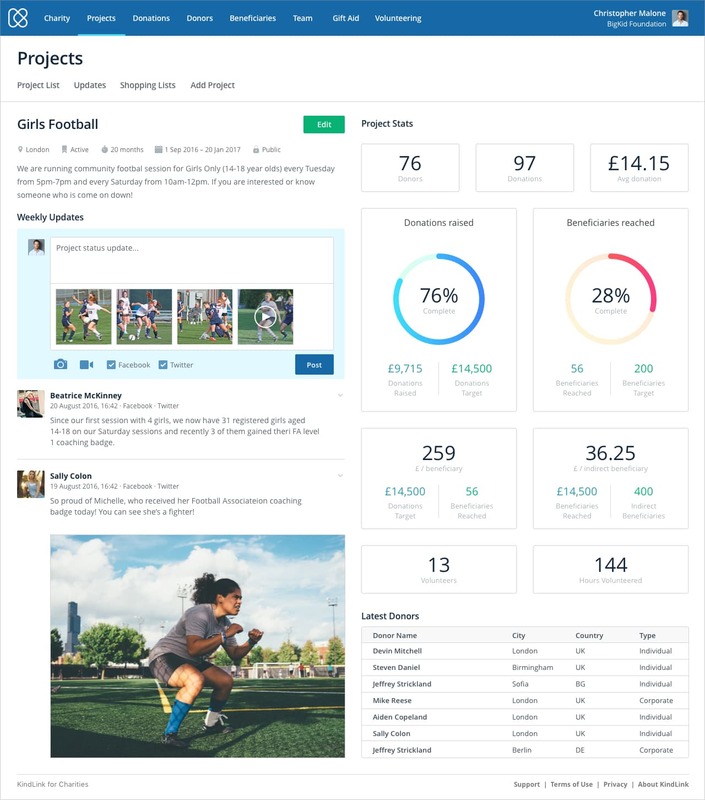 Organise your supporters, donations and beneficiary records all on one platform. KindLink is free for charities, CICs and any registered non-profit organisations. As an international charity, using as much money as possible toward field work is crucial to us. KindLink is 3 times cheaper than our previous provider. 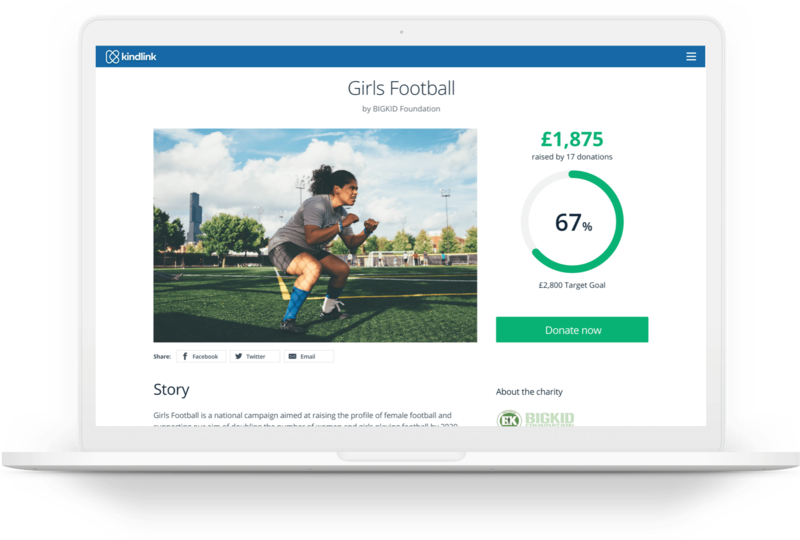 KindLink is an impressive resource for charities and voluntary groups, who can benefit hugely from its project and donation management systems. We are working together to highlight the potential of KindLink to as many local groups as possible. As a small charity, savings are crucial to us, so we tried various donation providers before switching to KindLink; their service is by far the cheapest and simplest to use. 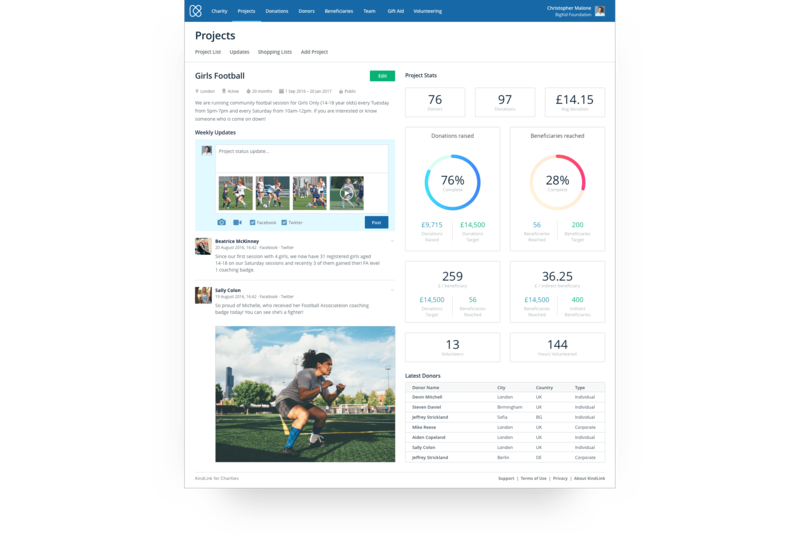 I have looked at KindLink’s concept and whilst we haven’t used it ourselves, it looks like it could be a very impressive service for smaller charities. This is our first attempt at raising donations online and we were unsure about whether we should or not. Using KindLink made this very easy and during our first month we have raised more than £4,000 through our KindLink profile and project features. As a small international charity, we don’t have much time to spend on social media. Being able to post on KindLink and other networks with one click has made a massive improvement. Without much technical background, I managed to embed KindLink’s beautiful donation form on my charity’s website in 10 minutes. As simple as that! KindLink has a very user friendly interface, which aids even the most non tech of our team! The system has spurred our charity on to implement Giftaid which is seamlessly managed through KindLInk. We do not charge any commission on the online donations you process through KindLink, only passing on the bank fees at 1.45% + 10p. This means you don’t waste money on fees and use it towards your great activities. Moreover, you can record any type of donations on KindLink, no matter whether you get a cheque in the post or equipment from a business partner. 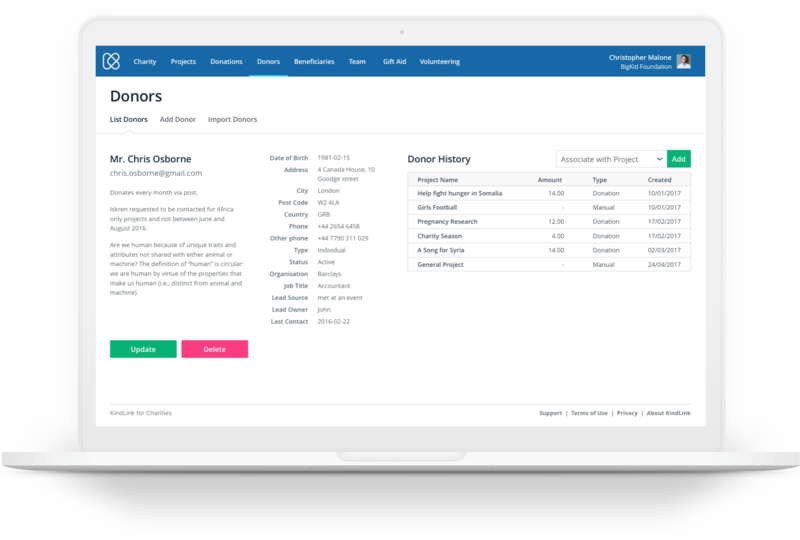 Keep track of your donors, volunteers and beneficiaries on the same platform. 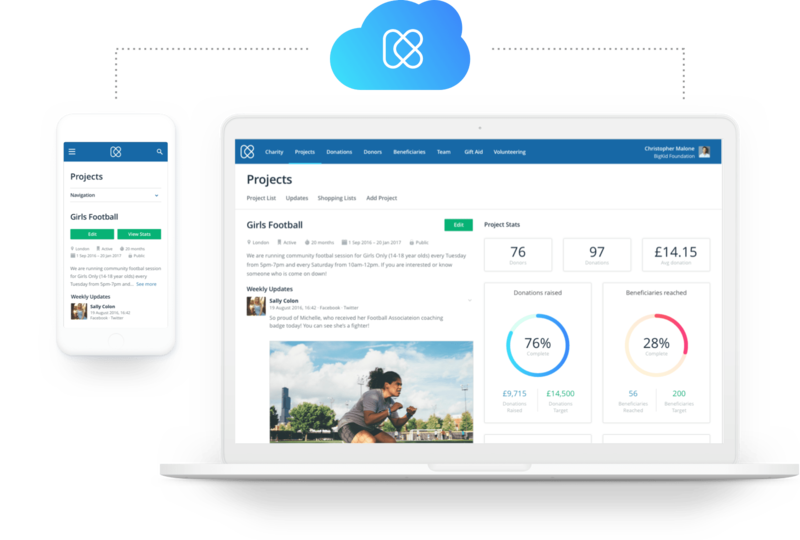 Be on top of your contacts: with KindLink, you can add and import unlimited contacts for free, search for and filter them, and be sure you know what your supporters have donated to, or want to know more about, with easy project associations. With KindLink, you are just three clicks away from receiving your Gift Aid money in the bank. 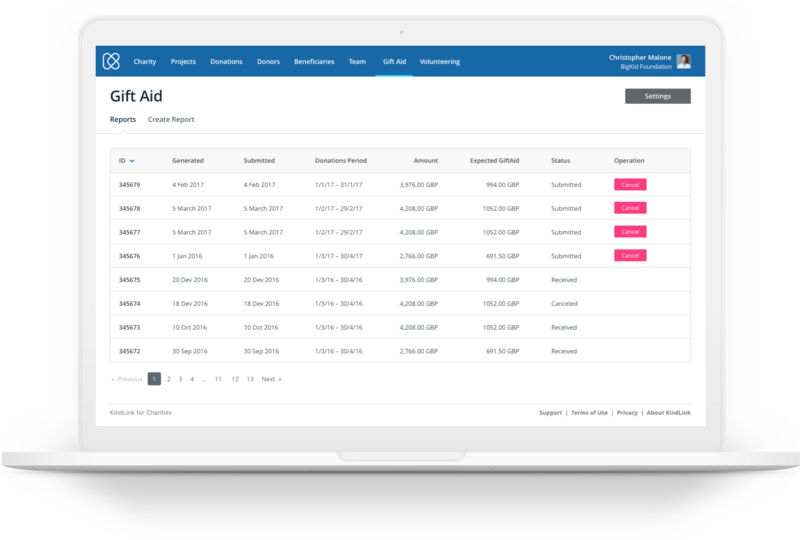 You can run reports and claim Gift Aid on all the online and offline donations any time you want and, thanks to our API integration with HMRC, you can be sure the claim is processed promptly and funds sent straight to your bank account. 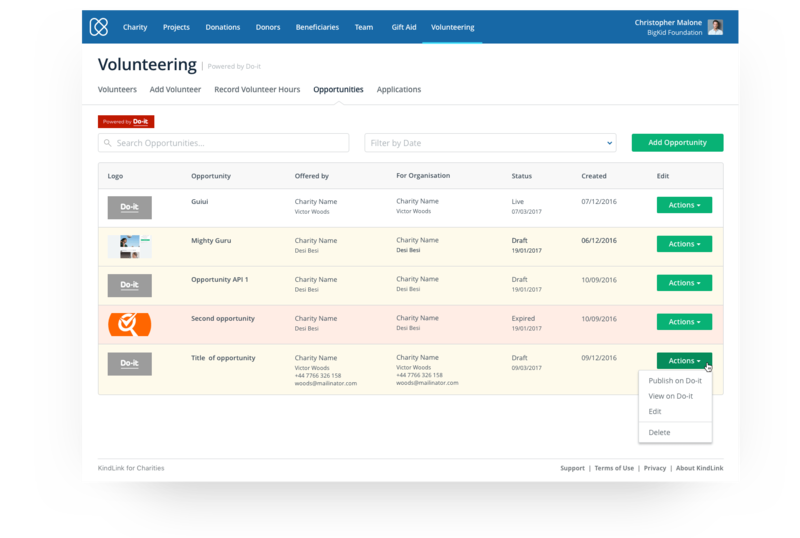 We have partnered with the Do-it Trust so that you can manage all your volunteer opportunities, applications and relations in one place. Also, thanks to the integration, you can place a donation button on your Do-it profile – every donation counts! Keep your individual and corporate donors engaged with inspiring stories of your activities and impact. With KindLink you are able to share stories on other social media too – you save time and ensure you reach as many people as possible. 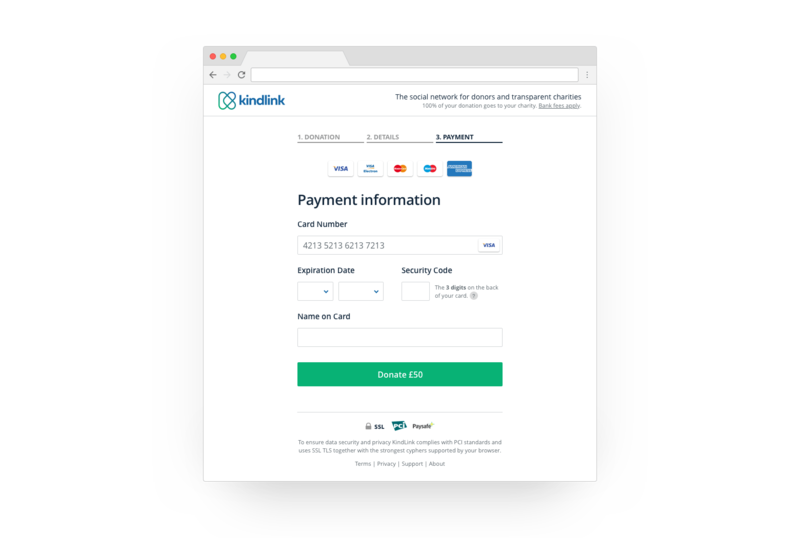 KindLink uses PCI-DSS compliant payment processing services and is registered with the Information Commissioner’s Officer, following the Data Protection Act and utilises an SSL certificate. We are also approved and listed by the HMRC as a certified Gift Aid Agent and are already compliant with all GDPR regulations. Built in the cloud, KindLink charity software is accessible from your office, home and even from your smartphone with no need of installation. You can also give access to your trustees to simplify communication with them and show your great work. Charities on KindLink save on average 62% when compared to their previous providers. Calculate your online donation fees. This is an estimate based on an average online donation of £20. Other services' combined fees vary between 2% and 10% of the donation amount. Share stories, raise funds. It's free.